Xenotilapia bathyphilus by Thomas Andersen. Is there more than one species? Amphilosus zaliosus by Jeffrey McCrary. The Arrow cichlid of Lake Apoyo, Nicaragua. The Genus Ptychochromis by Paul V. Loiselle. Species of this Malagasy cichlid genus, Part 1. 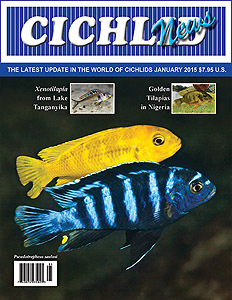 Cichlid Conservation Fund by Ad Konings. Status Update of the Stuart M. Grant Fund. Sarotherodon galilaeus by Lawrence Kent. St. Peter’s Fish from Africa. My Favorite 6 Cichlids by Spencer Jack. The well-known Canadian aquarist picks his favorites. Copyright © 2015 Aquatic Promotions, Inc. All rights reserved.